A college-wide program aimed at enhancing green practices throughout the Langford Architecture Center will be officially launched with a gala Earth Day celebration on April 22. The program is a joint project of the Texas A&M chapters of the American Institute of Architecture Students, the American Society of Landscape Architecture Students and Emerging Green Builders. The three student groups gathered in the Langford A atrium Wednesday evening to begin planning the event. They’ve divided into four working group: one to tackle educational issues, another targeting outreach, one focusing on the acquisition of recycling bins for the college and the other charged with figuring out how the recycle bins can be sustainably managed. 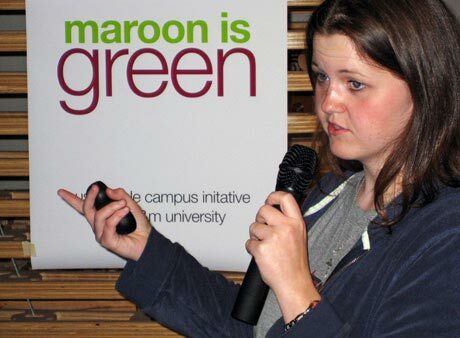 pictured above: Amanda Scott, president of AIAS, delivered the opening presentation at Wednesday's planning event. 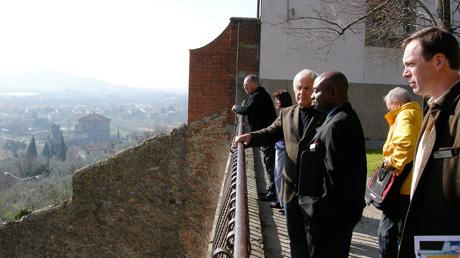 Forster Ndbuisi, head of the Department of Landscape Architecture and Urban Planning, second from right, visits with Paolo Barucchieri as the two stand an ancient Roman wall overlooking the town of Castiglion Fiorentino. At right is Tim McLaughlin, head of the Department of Visualization; At left is dean Tom Regan and his wife Lillian Woo. The Feb. 24-27 study abroad forum held in the medieval hamlet of Castiglion Fiorentino in Tuscany, Italy and organized by the Texas A&M College of Architecture, was widely characterized by participants as a seminal, watershed event, which provided insight that promises to greatly influence the future of study abroad initiatives at all participating universities. Participating in this first-of-its-kind forum were the directors of Texas A&M’s Office of International Studies, deans and department heads from the Texas A&M College of Architecture and representatives from four other U.S. universities. They were joined by the College of Architecture’s European faculty and other representatives from the college’s four primary European study abroad venues — Düsseldorf and Bonn, Germany; Barcelona, Spain; Manchester, UK; and the hosting facility, the Santa Chiara Study Center in Castiglion Fiorentino. Landscape and Urban Planning, an international peer-reviewed journal edited by Jon Rodiek, professor of landscape architecture and urban planning at Texas A&M’s College of Architecture, is ranked as a top science journal for 2006 by the ISI Web of Knowledge, a comprehensive online research platform. The ratings are compiled by Journal Citation Reports, which ranks thousands of journals in the sciences in categories by the number of times their articles are cited in other scholarly journals. Bonfire Memorial among best in U.S.
Texas A&M’s Bonfire Memorial is included as one of America’s 37 most beloved national landmarks in a new book by bestselling author and architectural historian Judith Dupré. 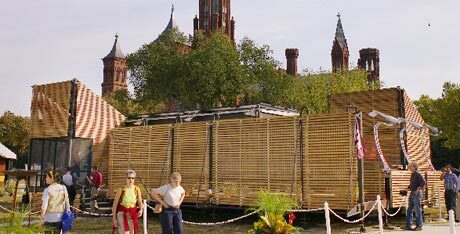 The book, “Monuments—America’s History in Art and Memory,” includes the Bonfire Memorial along with iconic structures like the Washington Monument, Vietnam Veterans Memorial and the Lincoln Memorial. 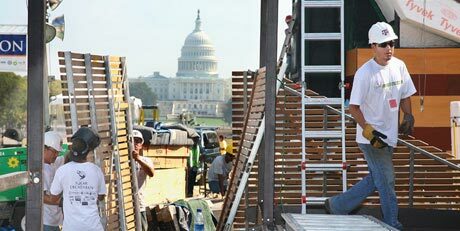 The show’s season premiere showcases the latest innovations in solar power with a behind-the-scenes look at the U.S. Department of Energy's Solar Decathlon, where 20 universities from the U.S. and Europe compete to build the best fully functional solar home on the Washington Mall. The homes demonstrate the most cutting edge solar-powered appliances, lighting, and hot water systems. A growing coalition of national organizations focused on the built environment has agreed to create a new National Academy of Environmental Design (NAED) to coordinate research, generate new knowledge, distribute vital information, and make recommendations to policy makers on how to reduce the negative impact of cities, buildings, landscapes, and transportation on our global climate. “The Association of Collegiate Schools of Architecture (ACSA) is leading the effort to establish a NAED,” said Tom Regan, dean of the college of architecture, in an e-mail he recently sent to college faculty and staff seeking ideas for and commitments to this initiative. The academy, he said, “would parallel similar national academies of science, engineering and medicine. Students and representatives from participating firms participated in charettes in the third floor of Langford building A.
Peter Walker talked about his experiences as the co-designer of “Reflecting Absence,” the National September 11 Memorial design at the site of the fallen World Trade Center in New York City, during his Feb. 22 appearance at the 37th annual Aggie Workshop. Walker, a fellow in the American Society of Landscape Architects (ASLA) and one of the most lauded names in landscape architecture, was the keynote speaker at the two-day event, hosted by Texas A&M University’s student chapter of the American Society of Landscape Architects. Professor Carol LaFayette and Viz lab student Lauren Simpson were interviewed by PBS about their animation of an ant colony. “Visualizing the Future,” an episode of the PBS “State of Tomorrow” series featuring the work of students and faculty in the Visualization Laboratory at the Texas A&M College of Architecture can now be viewed online. 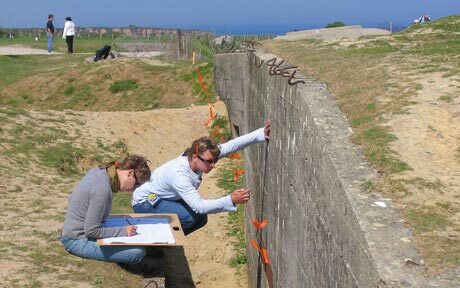 Graduate students and professors from Texas A&M University are heading back to Normandy, France during spring break to continue documenting the Pointe du Hoc battle site where U.S. Army Lt. Col. Earl Rudder led a charge up 90-foot cliffs to engage the German Army during World War II’s D-Day invasion. The trip will be the continuation of surveying and documenting the site that began in 2004. Erosion from the English Channel, wind and rain is threatening the site. The Texas A&M College of Architecture’s Center for Heritage Conservation is helping preserve Dallas history by documenting two buildings, just 15 miles from downtown, that are among the oldest in the city still sitting on their original sites. 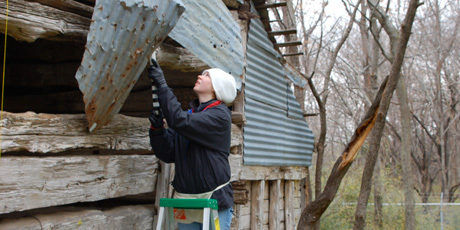 The 1850s buildings, a barn with two stalls for cattle or feed and a one-room log house with a hand-dug well and a root cellar, stand on the old Grady Niblo farmstead southwest of downtown Dallas. They are part of a 71-acre site recently bought by developers, who are building single-family residences on the site. The Center for Housing and Urban Development’s mission to improve the lives of colonias residents was highlighted in a recent story in the Battalion. The center and it’s Colonias Program are part of Texas A&M University’s College of Architecture. “We’ve been out in the colonias for 15 years,” Oscar Muñoz, deputy director of CHUD, told The Battalion in the Feb. 26 story. "What we're trying to do is to help them connect with the system, to help them learn how the system works. 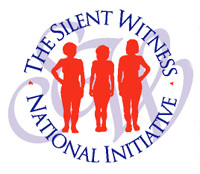 We help with education, with health, with human services, job training, nutrition for elderly and youth and with housing." Julius Gribou, former head of the Department of Architecture at Texas A&M University, has been named executive vice provost for the University of Texas-San Antonio. An architect with more than 20 years of international networking experience, Gribou headed the Texas A&M architecture department 1992 – 2000. As executive vice provost at UTSA, he will be responsible for building space utilization, renovation and allocation. Two creations by graduate visualization science students from the Texas A&M College of Architecture, were recently linked to the cartoonbrew.com website where they are garnering a lot of praise. The Battalion’s Feb. 21 edition featured a story on Texas A&M architecture students’ designs for Isaiah’s Place, a 40-acre equestrian facility serving the hearing impaired. The student designs were unveiled at a Feb. 15 public presentation at the HKS, Inc. offices in downtown Dallas. The work included master plan and architectural design concepts for the facility, which is located in Whitney, approximately 70 miles south of the Dallas-Fort Worth metroplex. pictured on the right: Teri Whitney shows some of the work she and her fellow students have produced for an equestrian center serving the hearing impaired. Most people will drive rather than walk much more than a quarter- or half-mile, unless they’re seeking exercise or recreation, said Chanam Lee, assistant professor in the Department of Landscape Architecture and Urban Planning at Texas A&M University, in a Feb. 24 story in the Asheville Citizen-Times, a newspaper serving that North Carolina city. Joseph Self, a former faculty member in the Texas A&M College of Architecture, and his architecture business, Firm 817, were featured in a Feb. 18 article appearing in the Fort Worth Business Press. The display created by Cook, left, and Frye helped keep things interesting for College of Architecture visitors during Aggieland Saturday. Texas A&M University architecture students Adam Frye and Justus Cook lit up the fourth floor by the Langford A Mac Lab on Aggieland Saturday with a project for their ARCH 406 studio, taught by Terry Larsen. “We were given a bunch of stock student footage from the past year or two and put it all together, added effects and timed it to music,” said Frye. The show, which he and Cook called “The Compelling Presentation,” lasted 1:52 seconds on a loop. It was projected on a series of Styrofoam rectangles hanging at various heights and depths. 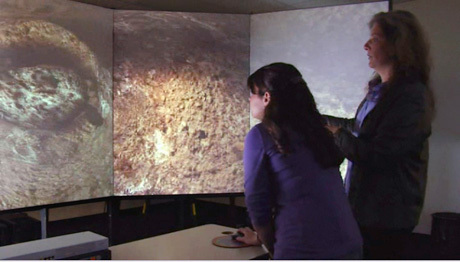 The projection on the translucent medium was visible from both sides. Live-PR Public Relations and News announced the launch of Villa Nova Builders, an Austin home building and remodeling company owned by Texas A&M construction science graduate Mitch Blinco ‘86, recently launched a new website, according to an announcement appearing on the Live-PR Public Relations and News website. The use of cypress by Texas A&M and other schools' 2007 Solar Decathlon entries was noted in a recent article in Building-Products.com. The use by the Aggie Solar Decathlon team of cypress wood in its competition solar home was cited in a story appearing in the current issue of Building Products Digest. “The cypress really gave our home a distinct appearance,” said Pliny Fisk, the Texas A&M architecture professor who spearheaded the Aggie Solar Decathlon initiative. He said many visitors to the Aggie solar home complimented the team’s use of cypress in its entry. A feature on Pulitzer-prize winning playwright Charles Gordone appearing in the Friday. Feb. 22 issue of The Battalion was accompanied by a full, front-page spread of paintings of Gordone by Robert Schiffhauer, assistant professor in Texas A&M University’s Department of Architecture. Brandon Berdoll was elected the Associated General Contractors Gene Murphree Construction Science Outstanding Undergraduate in the August 2007 graduation class. The Department of Construction Sciences recognized three outstanding students in its December 2007 graduating class; Farzana Sultana, Ben Liggett and Justin Goodman. Bradley Bertrand, a fourth-year architecture student, was one of two A&M students who received the Aggie Spirit award in September 2007. Bertrand enrolled in a “full load” of classes just weeks after having surgery to treat a brain tumor. 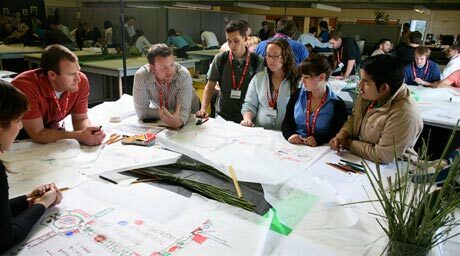 Architects, mathematicians and artists came together in May 2007 as the College of Architecture hosted the International Society of the Arts, Mathematics, and Architecture (ISAMA) annual convention. Master of Architecture student Joohyun Lee was one of 16 finalists in the international Architects for Health’s “First Student Health Design Competition.” She and her fellow finalists in presented their projects at the Royal Institute of British Architects headquarters in London. Breathe Hope, a university-recognized student organization, raises funds to battle cystic fibrosis in memory of Linsday Widener, a former environmental design student who lost her spirited battle with the disease in October 2005. She was just a semester away from graduating. Five clients of the Energy Systems Laboratory, including Texas A&M University, were presented with Mega Energy Saver Awards during a Aug. 30, 2007 ceremony at the George Bush Presidential Library and Museum Complex. Lou Tassinary, professor of architecture and associate dean for research at the Texas A&M University College of Architecture, was elected secretary of the Society for Psychophysiological Research. His term runs through 2011. The SPR is the leading society dedicated to the research of how the mind and body work together. College of Architecture professor George J. Mann has been appointed the official liaison from the American Institute of Architects to the International Union of Architects’ Public Health Group. The Bureau of Delight invites College of Architecture students, faculty and staff to grab their bocce balls and gather at 4 p.m. Friday, March 7 on the lawn in front of Langford A for a sporting afternoon break. Bocce, pronounced baa chee, is an ancient game of accuracy similar to lawn bowling but played on a shorter, narrower green. A game can be contested between two players, or two teams of two, three, or four. Those who have their own bocce balls are encouraged to bring them; so several games can be simultaneously in play. The event will be held if the weather permits. 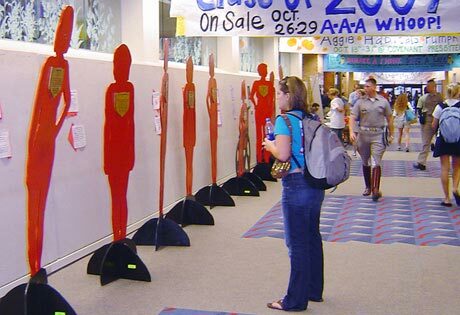 The Langford B Exhibit Hall will be a somber scene March 20 with the arrival of “Silent Witness,” an exhibit depicting wooden silhouettes of individuals who have been murdered by acts of relationship violence. Hotels and Health Care Projects: “Recent HKS Hospitality (Hotels) and Healthcare Projects” is the title this Architecture-for-Health lecture sponsored by the Center for Health Systems and Design and the Student Health Environments Association. The lecture, slated for noon in the Langford A205 conference room, features Nunzio De Santis, executive principal and director of hospitality, and Marc Budaus, vice president, both of HKS, Inc. The American Institute of Architecture Students will hold a general meeting 6:30 – 8 p.m. in Langford C105. For more information, contact Amanda Scott at ag00d@tamu.edu. “Research Informed Design, Safety, & Improved Outcomes” a lecture by Kirk Hamilton, associate professor of architecture at Texas A&M University, begins at noon in Langford A205. The presentation is part of the Architecture-for-Health Lecture Series sponsored by the Center for Health Systems and Design and the Student Health Environments Association. “Bonding, Insurance & Contracts,” an Interdisciplinary Capstone Lecture by Steve Nelson of The Beck Group, is slated for 1:50 p.m. in Room 009 of the Williams Administration Building. For more information, contact John Cargill at jtcargill@yahoo.com. Egg Drop: Anne Nichols’ ENDS 231 students will drop their egg container designs 3:35 – 5:35 p.m. from the northeast side of 3rd floor Langford and below in the atrium to the first floor of building A. For more information, contact Anne Nichols at 845.6540 or anichols@tamu.edu. Egg Drop: Shelley Holliday’s ENDS 231 students will test their egg container designs by dropping them 9 – 11 a.m. from the northeast side of 3rd floor Langford and below in the atrium to the first floor of building A. For more information, contact Shelley Holliday at 845.7885 or sholliday@tamu.edu. Healthcare architecture lecture: Mattia Flabiano, principal of Dallas firm Page Southerland Page, presents “Page Southerland Page: Designing for the Future since 1898” at noon in Langford A205. It’s part of the Architecture-for-Health Lecture Series sponsored by the Center for Health Systems and Design and the Student Health Environments Association. “Seeking the City: Visionaries on the Margins,” is the title of the Association of Collegiate Schools of Architecture’s 96th annual meeting held this year in Houston. For more information, contact Ginger White at 845.0129 or gwhite@tamu.edu or visit the ACSA meeting website. Research Centers Open House: The College of Architecture research centers will be holding a combined open house to provide students with the opportunity to learn about the college’s centers and their certificate programs 11 a.m. – 1:30 p.m. Langford A Atrium. For more information, contact Trisha Gottschalk at 845.2030 or trishag@tamu.edu. The National Association of Home Builders Texas A&M Student Chapter meets 7 – 9 p.m. in the Preston Geren Auditorium. For more information, contact Trey Mailhes, 361-443-0734 or treymailhes@tamu.edu. Room sterilization lecture: Matthew Mitchell of the STERIS Corporation presents “New Directions in Advance Room Sterilization in Hospitals and Health Facilities,” as part of the Architecture-for-Health Lecture Series sponsored by the Center for Health Systems and Design and the Student Health Environments Association at noon in Langford A205. Artist-in-residence Paolo Piscitelli and his students’ work will be on display in the Langford B Exhibit Hall. There will be a reception April 8 from 6-7 p.m. For more information, contact Mary Saslow at 845.7073 or saslow@viz.tamu.edu. Health Care Architecture Lecture: “The Importance of Cookie Baking” is the title of this Architecture-for-Health lecture sponsored by the Center for Health Systems and Design and the Student Health Environments Association. The lecture, slated for noon in the Langford A205 conference room, features Jonathan Bailey, president, managing director, and chairman of Jonathan Bailey Associates in Langford A205 at noon. “Proposals & Interviews,” an Interdisciplinary Capstone Lecture featuring Chad Schreiber and Ryan Montgomery of The Beck Group, is set for 1:50 p.m. in Room 009 of the Williams Administration Building. For more information, contact John Cargill at jtcargill@yahoo.com. LAUP Scholarship Banquet: The Department of Landscape Architecture and Urban Planning’s celebrates student achievements and awards scholarships at the Briarcrest Country Club 6 – 10 p.m. For more information, contact June Withers, 845-1046 or jwithers@archmail.tamu.edu. Visiting Artist Terry Allen’s work will be on exhibit in Langford B Exhibit Hall. He is also teaching a workshop during his stay. For more information, contact Mary Saslow at 845.7073 or saslow@viz.tamu.edu. Lecture eyes Friesen Concepts: Larry Lammers, president of Lammers and Gershon Associates of Reston, Va. presents “The Friesen Concepts — The Impact on Today’s Hospital Design,” an Architecture-for-Health lecture sponsored by the Center for Health Systems and Design and the Student Health Environments Association in the Langford A205 at noon. 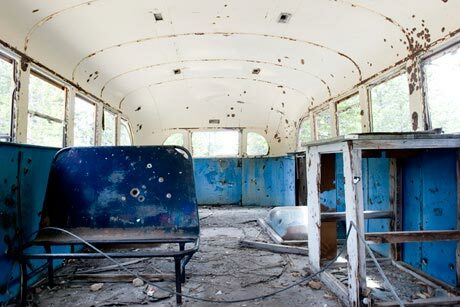 “Forgotten Spaces,” a photo exhibit by Andrew Pogue, a senior environmental design student at Texas A&M University, will be held 6-10 p.m. April 4 at the House Painting Studio, which is located above the Dollar General Store in downtown Bryan, Texas.